IBM Watson Media's Video marketing module allows you to tailor your viewers experience and capture specific data to help generate quality leads for your business. One of the most important tools that the video marketing module offers you is the Registration gate. The Registration gate allows you to control the information your viewer sees when they first land on your player's page, what information they will provide to you as the broadcaster, and what call to action they will receive after a broadcast is finished. 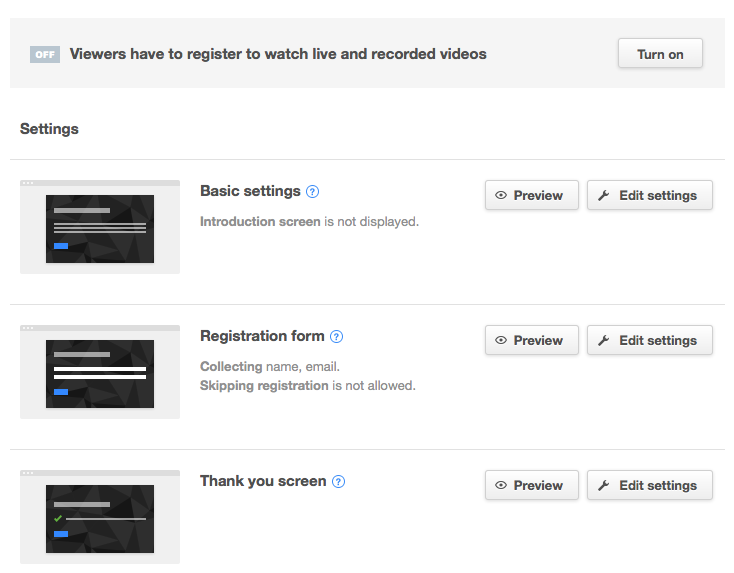 To set up the Registration gate, first log in to your Video Streaming account and hover over your login icon. Click on 'Channel settings'. This will take you to the channel section of your Dashboard. Click on the name of the channel you wish to set up a registration gate for. In the left hand column, you will see a list of different tabs that control settings for the channel you have selected. Scroll to the bottom of the list, and choose 'Registration gate'. The registration gate has several different tabs. An explanation of each is below the image. 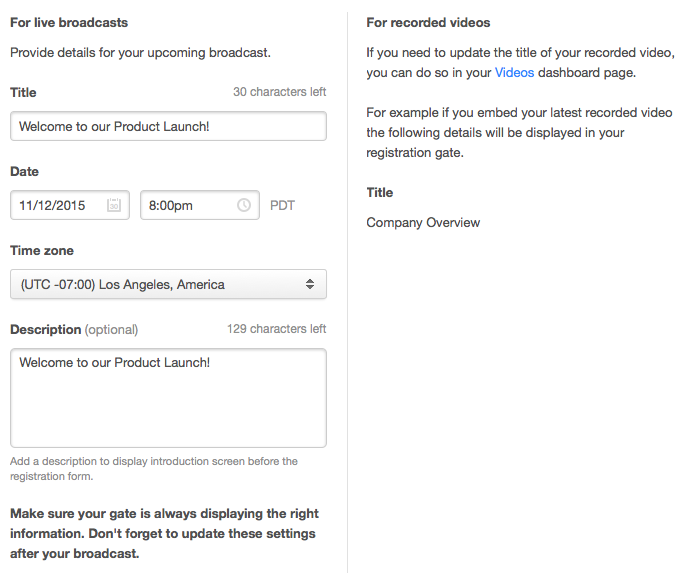 Viewers have to register to watch live and recorded videos: This button allows you to toggle whether or not viewers must enter their information in order to watch content on your channel. Basic Settings: The basic settings field is the first field that a user will see when opening a page that has your IBM Watson Media player embedded. You can edit the content of this page by clicking the edit settings button. The edit settings field will allow you to change the title of the first slide, the date and time shown for the broadcast, and provide a description of the upcoming broadcast. After making your changes, you can preview the slide with the preview button, and save your changes with the Save button. 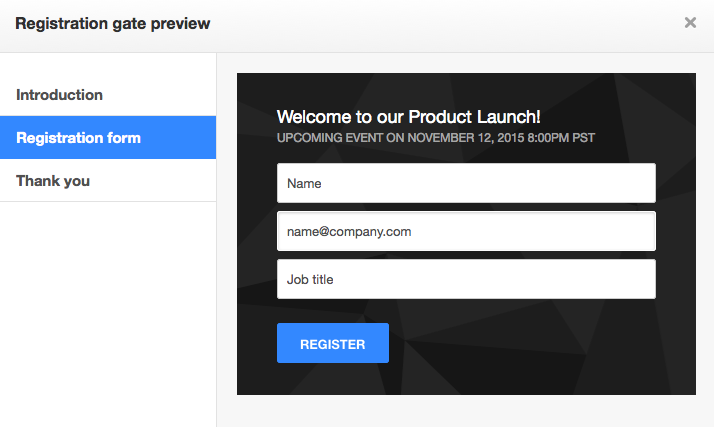 Registration Form: The Registration form allows you to collect customized pieces of information from your viewers, such as name, email, job title, etc. You can customize this field by clicking on the edit settings button. 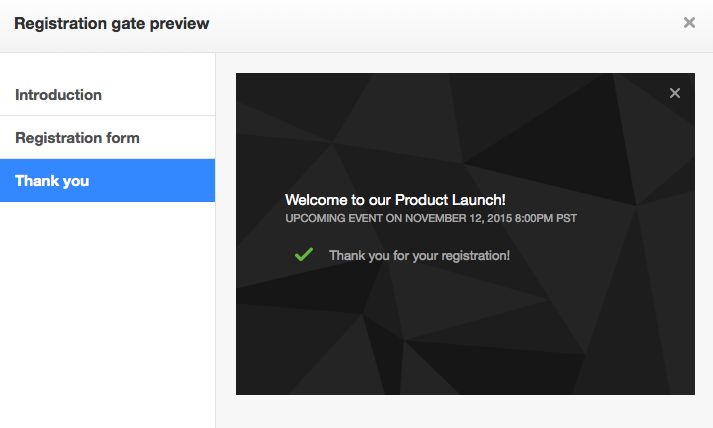 Thank you screen: The Thank you screen allows you to customize the message that viewers will get after successfully registering for the event. You can add a message directly to this field. As always, make sure to preview and save your changes after editing. Here is a preview of the thank you message that your viewers will see. Once the user closes this field with the 'X' in the upper right corner, they will be able to see the broadcast. 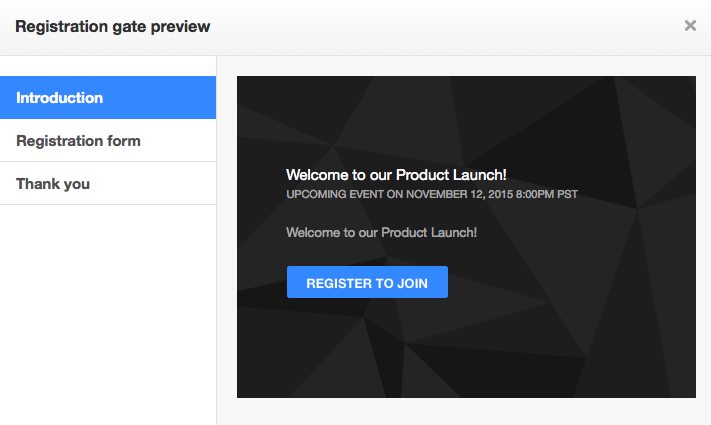 NOTE: The registration gate feature of your account will work with all embeds of your player. 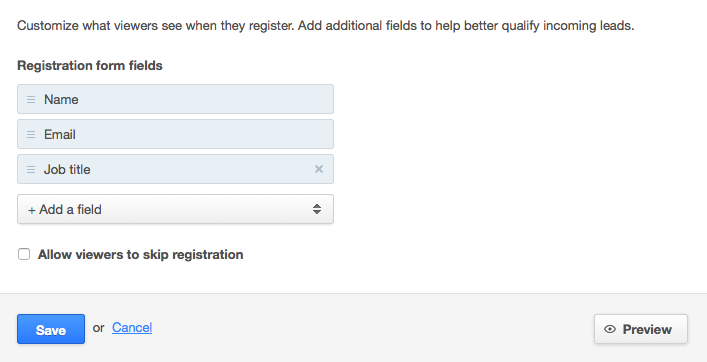 However, the registration gate does not carry over when using Inline Playback for use in Facebook or Twitter.